Johanna Trimble, http://www.isyourmomondrugs.com, is a passionate patient advocate and a World Health Organization Patient Safety Champion. 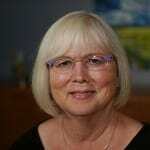 She is on the steering committee of the BC Patient Voices Network and belongs to Patients for Patient Safety Canada. She is a public member of the Patient Safety Advisory Committee, Vancouver Coastal Health Authority. In 2010 she won a “best poster” award at an international conference for her poster: “Is Your Mom on Drugs?” about the overmedication of her mother-in-law. She presented a plenary talk on overmedication at the 2011 Canadian Cochrane Symposium. She also champions the improvement of home and community care to end the reliance on hospital and residential care, often neither the choice nor the optimal care setting for the frail elderly. She is a member of the provincial Optimal Prescribing Update and Support team and the Polypharmacy Working Group. These teams develop continuing education for doctors in BC on safe prescribing practices.